The Illinois State University Honors Program awards this competitive tuition scholarship to select incoming freshmen who have been admitted to the Honors Program. Prospective students who have presented impressive academic credentials and demonstrated exceptional writing skills are eligible for consideration. Recipients of this scholarship comprise approximately 10% of applicants seeking admission to the Honors Program. Congratulations! 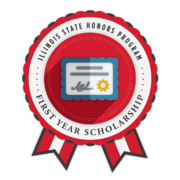 This badge recognizes your selection as a recipient of the Honors Program First Year Scholarship by the Illinois State University Honors Program.